Clint Eastwood is not a film stylist. No fancy camera angles. No innovative editing. No signature flourishes. What he is is a terrific and seemingly effortless storyteller, one of the best now making movies. Exhibit A is “Sully,” Eastwood’s recreation of 2009’s “Miracle on the Hudson,” in which a crippled jetliner landed on the Hudson River without the loss of one of the 155 souls aboard. Tom Hanks stars as Capt. Chesley Sullenberger, the 40-year aviation veteran who within seconds of losing both engines to a flock of Canada geese realized a return to La Guardia Airport was impossible…that the only chance of salvation was a water landing. Todd Komarnicki’s screenplay (based on the memoir by the real Chesley “Sully” Sullenberger) devotes half of the film’s 96-minute running time to the brief flight and the crash itself. The near-disaster is experienced from several vantage points (pilots and crew, passengers, first responders, witnesses), with each iteration providing new insights and not a few thrills. This is absorbing, shocking, logic-defying stuff. Computer simulations suggested that the damaged aircraft could have returned to the airport. Did Sully make a bad call that put everyone on board at risk? Tom Tykwer’s “A Hologram for the King” begins with what appears to be a music video. 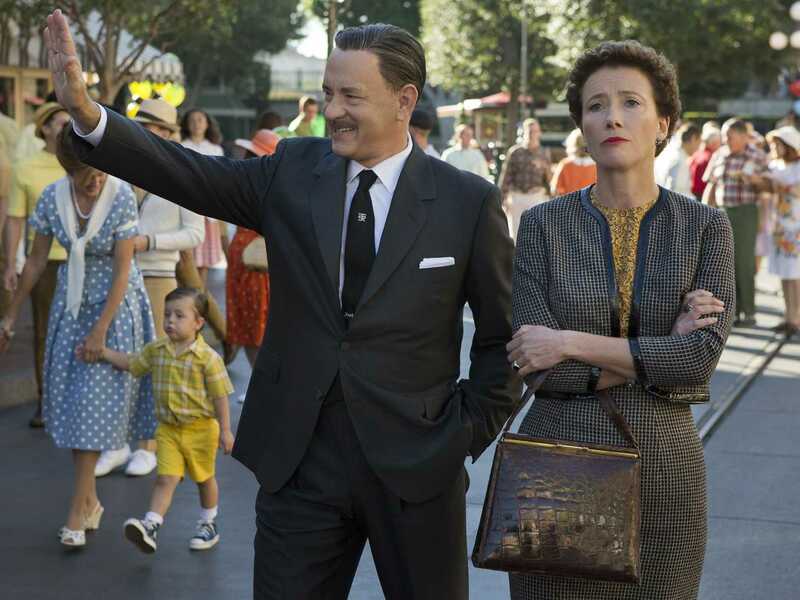 Tom Hanks, in suit and tie, is moving through a suburban neighborhood singing the Talking Heads’ “Once in a Lifetime.” As he cover the song’s lyrics — “You may find yourself looking for your large automobile; you may find yourself without a beautiful house, without a beautiful wife…” –those objects of middle-class American happiness and stability vanish in clouds of garish purple smoke. What the hell kind of movie is this, anyway? Well, it’s a pretty great one, actually, although its charms are slow in developing. That musical interlude, it turns out, is a dream that businessman Alan Clay (Hanks) is having while napping on a jet bound for Saudi Arabia. He awakens to find himself in the middle of an Islamic religious ceremony. He’s the only person on board not dressed in white and making a pilgrimage to Mecca. Alan, whose career and marriage both have hit rock bottom, is trying to start over. He’s landed a job with a huge American telecommunications firm and is en route to Saudi Arabia to make a presentation of his firm’s latest technical innovation, a communications system that allows callers to converse with a life-size, three-dimensional hologram of the person on the other end of the line. The Saudi king will personally choose the winning bid; the job will be worth millions. Being a can-do sort of guy and a born salesman, Alan hopes to reverse his business fortunes. Things aren’t so easily fixed in the marriage department. His ex wife hates his guts. Mostly Alan feels guilty because he can no longer pay for college for his adoring daughter (Tracey Fairaway), who has dropped out and taken a job waitressing. From the minute he touches down, things start going wrong. Alan has a killer case of jet lag and keeps missing the shuttle to the city of the future out in the desert where he’s to make his presentation. The Saudi bigwigs with whom he is supposed to meet have made themselves scarce and the three American technicians already on site are working out of a huge tent where there’s no wi-fi, inadequate air conditioning, and nothing to eat. It’s going to be a disaster. Except that it also may be the greatest experience of Alan Clay’s life. 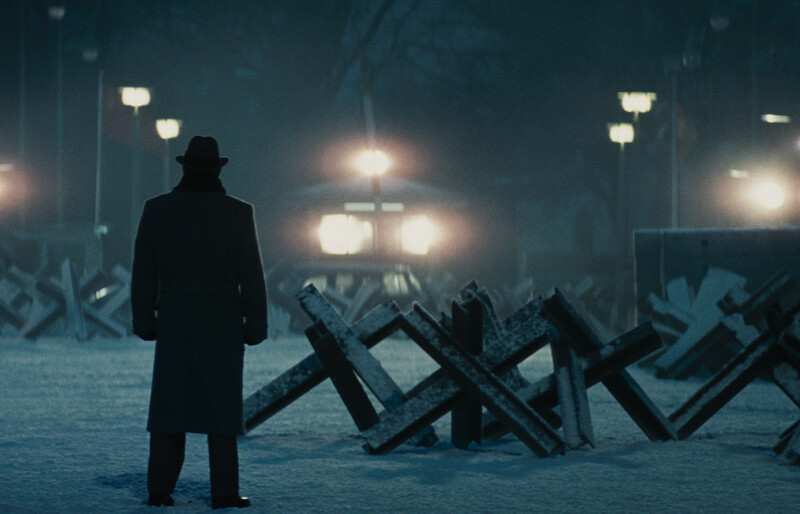 Tom Hanks’ singular status as this century’s James Stewart pays off big time in “Bridge of Spies,” Steven Spielberg’s recreation of one of the Cold War’s lesser known stories. As the real-life James Donovan, a New York insurance lawyer pulled into the world of espionage and international intrigue, Hanks is wry, moving, and astonishingly ethical. He practically oozes bedrock American decency. Which was precisely what this movie needs. The screenplay by the Coen Brothers and Matt Charman runs simultaneously on four tracks. In the first Soviet spy Rudolf Abel (Mark Rylance) is arrested in NYC in 1957 by federal agents. As no lawyer wants to represent him, the Bar Association basically plays spin the bottle — and assigns the job to Donovan. Jim Donovan believes that every accused person deserves the best defense possible. In fact, he alienates the judge, the feds, and the general public by standing up for his client’s rights and assuming that this is going to be a fair trial when everybody else wants just to go through the motions before sentencing Abel to death. On a parallel track is the story of Francis Gary Powers (Austin Stowell), a military flyboy recruited for a top-secret project and trained to spy on the U.S.S.R. from a one-man U-2 reconnaissance aircraft. Alas, on his very first mission in 1960 he’s shot down, fails in an attempt to commit suicide, and falls into the hands of the Commies. Then there’s the arrest in 1961 of Frederic Pryor (Will Rogers), an American grad student studying economics who finds himself trapped on the wrong side of the newly constructed Berlin Wall and vanishes into the labyrinthine East German justice system. All this comes to a head when Donovan, several years after Abel’s conviction, is dispatched to Berlin in an ex officio capacity to arrange a swap of the Soviet spy for Francis Gary Powers. And if in the process he can somehow free Fred Pryor from a damp cell, so much the better. 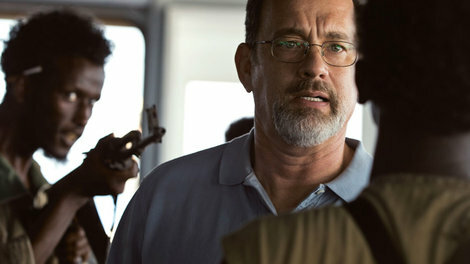 Tom Hanks’ near-uncanny ability to build a compelling Every Man character out of minimal substance is put to good use in “Captain Phillips,” director Paul Greengrass’s tension-charged recreation of a real-life 2009 hijacking of an American freighter in the Indian Ocean. Capt. Richard Phillips, the main player in the incident and in this film, is a somewhat controversial character. He was hailed as a hero after Navy Seals rescued him from the lifeboat on which he was being held by four Somali pirates. But since then members of his crew have sued Phillips for what they say was a reckless disregard for their safety by insisting on navigating close to the Somali coast – thus saving time and money – rather than plotting a course further out to sea. Hanks and Greengrass have it both ways. We see early on that Phillips can be something of a tough captain – not a Queeg-ish martinet, exactly, but forceful enough to irritate some of his crewmen. But he’s also a resourceful fellow looking out for his men in a crisis. It’s hard to say precisely what sort of a guy he is. “Captain Phillips” lives mostly in the moment, and we don’t learn a whole lot about our protagonist except when he’s under the gun. Early on we see him driving to the airport with his wife (Catherine Keener, filmed so obliquely she’s hardly recognizable) and we learn that he’s married with a couple of college-age kids. And that’s about it. Under most circumstances this would result in a movie with a hole where its center should be. But Tom Hanks fills the void with his own star presence. And it pretty much works. I was prepared to be irritated by “Extremely Loud and Incredibly Close.” And I was. This is a movie about a too-cute kid (he may or may not be autistic) who after losing his father in the 9/11 attack goes on a borough-to-borough scavenger hunt throughout NYC, attempting to solve the final conundrum left by his puzzle-posing papa. This yarn has an off-the-charts potential for preciousness. And yet by the end, Stephen Daldry’s film adaptation of Jonanthan Safran Foer’s novel had me by the throat and the tear ducts.